I was of the understanding that this had already been done but it appears not, certainly it was mentioned to be happening a few years ago. Reading has already done this with a large amount of its Enviro 400H’s. Edinburgh is certainly a very hilly city having seen for myself at the weekend, saw a couple of the 11 reg hybrids running over the big iron bridge that traverses Edinburgh Waverley Station. Not directly related to this new vehicle order, but Lothian Buses t/a Lothian Country buses have introduced new routes X27/28 from Edinburgh to Bathgate using ex-First/Metroline route 18 Volvo B9TLs. These photos illustrate examples, which have been refurbished using red seats instead of green ones which would have matched the Country livery better. Maybe they would switch to the mainstream Lothian Buses city network if these routes do not attract sufficient traffic from First or ScotRail? And here is what Lothian Buses ordered! Wow! Wonder if London will borrow one for trials? 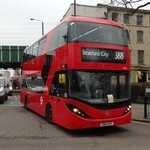 This tweet from ADL says they are 13.4m long and it will be known as the Enviro400XLB. Love the engine specs, 350hp on the D8K engine. The issue of a vehicle of such a large capacity, is that boarding and alighting times could be very slow, particularly as busy stops. Only really ideal for express routes, or regional routes where most passengers travel between the same destinations. However, ADL may be offering multiple lengths of this. Tri-axles would only reallt catch on in London at a similar length to the BCI trial (i.e. slightly longer than an LT). And yet ADL themselves are very clear that this is NOT an Enviro 500. It's on their launch article on their website. They're actually defined as the E400XLB as the body structure is more commonplace with the standard E400 MMCs than with the E500 variants, the latter which are still confined to international orders.